We’re used to seeing pictures of flying rally cars – we all know the iconic shots of Quattros and Imprezas – but a modern Ford Fiesta has taken the idea to new heights. Literally. 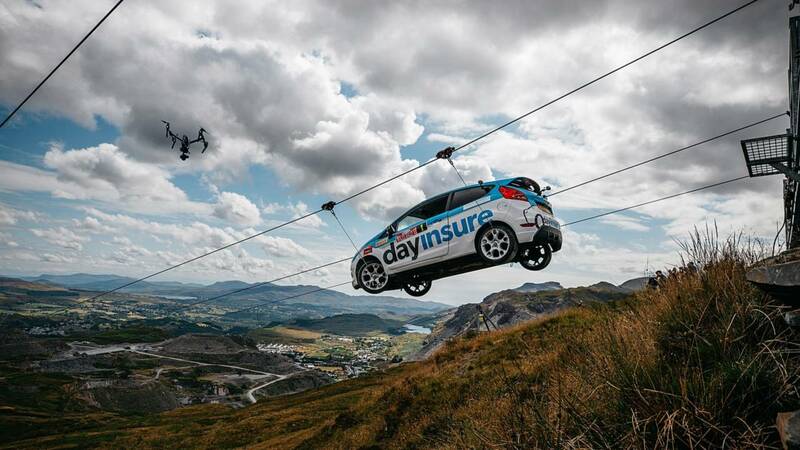 As part of the promotional material for the Dayinsure Wales Rally GB, footage has surfaced of the rally car shooting down a zip wire at the Zip World tourist attraction in north Wales. The 90-second video features British Rally Championship leader Matt Edwards, who fires up the Fiesta and sets off down the zip line. The car hurtles through stunning Welsh mountain scenery, before landing on terra firma and setting off through a rally stage. Filmed at Slate Mountain, which will hold two speed tests on the Friday of this year’s Wales Rally GB, the film shows Edwards skilfully drifting around piles of slate. Local hero Elfyn Evans also takes a cameo role in the film, after becoming the first Welshman to win a round of the World Rally Championship at last year’s Wales Rally GB. "The stunt sounded absolutely crazy when I first heard about it and, believe me, it was even crazier to witness. I’m just glad it wasn’t me in the car," he said. Ben Taylor, the managing director of Dayinsure Wales Rally GB, described how the "crazy" video came to fruition. "To promote the thriving adventure sports destinations in north Wales which, of course, includes the World Championship rally, our original thoughts were to put some of the top drivers down the zip wire," he said. "But together with Zip World and our title partners at Dayinsure, we all got a bit carried away…"
Dayinsure Wales Rally GB, Dayinsure, Zip World and Slate Mountain have joined forces to produce the sensational #Skydriver viral video promoting the UK’s forthcoming round of the FIA World Rally Championship, adventure tourism in north Wales and the increasingly popular availability of short term vehicle insurance. Filming for the mind-boggling stunt took place at the Llechwedd Slate Caverns visitor attraction – an award-winning adventure sports and heritage destination which for the very first time will be hosting two thrilling speed tests on the Friday of this year’s Dayinsure Wales Rally GB (4-7 October). Located high up in Snowdonia just to the north of Blaenau Ffestiniog, the venue also is home to Zip World Titan, the largest zip zone in Europe. Without giving the game away, both Slate Mountain and Zip World feature strongly in #Skydriver. Edited for social media audiences, the 90-second video stars Matt Edwards, the ace who’s currently leading the Prestone MSA British Rally Championship, plus a brief cameo appearance from Elfyn Evans who famously won last year’s Dayinsure Wales Rally GB to become the first, and only Welsh driver to win a round of the premier league FIA World Rally Championship. “To promote the thriving adventure sports destinations in north Wales which, of course, includes the World Championship rally, our original thoughts were to put some of the top drivers down the zip wire… but, together with those at Zip World and our title partners at Dayinsure, we all got a bit carried away,” admitted Ben Taylor, Managing Director of Dayinsure Wales Rally GB. “We certainly did,” confirmed Dennis Ryan, Dayinsure’s Founder and Chairman. “We offer short-term online insurance on almost all kinds of vehicles, but this was one car that we certainly wouldn’t be keen to cover! For once Evans, no stranger himself to flying high in rally cars, was a just an avid spectator. “The stunt sounded absolutely crazy when I first heard about it and, believe me, it was even crazier to witness. I’m just glad it wasn’t me in the car,” he grinned after witnessing what is believed to be the first-ever feat of its kind performed anywhere on Earth.